Once per game, Bai Ju Yi can turn all his red cards into spade attacks. When Bai Ju Yi uses his first power, he can use any number of attacks. 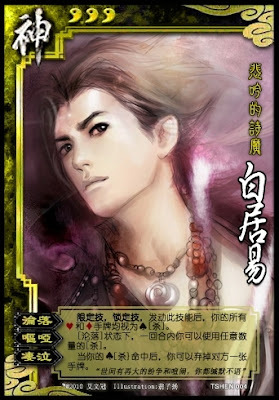 When Bai Ju Yi hurts someone with a spade attack, he discards a card from the target. Bai Ju Yi can use "Rescued" once for the whole game, but the effect lasts the whole turn. He then cannot use a red card as anything but an Attack.